Tornadoes. Tsunamis. Earthquakes. Hurricanes. Why does God allow such disasters to happen? Our hearts ache when we remember the hundreds of thousands of people left homeless and without hope when Hurricane Katrina crashed against the Gulf Coast. Or the staggering death toll in Japan after the island's earthquake and tsunami swept away entire villages. Whether we see the devastating accounts of a natural disaster in the news or personally face a catastrophe, we find ourselves asking, are these truly the acts of a loving and compassionate God? In An Act of God? (an updated edition of the previously published Where Was God? 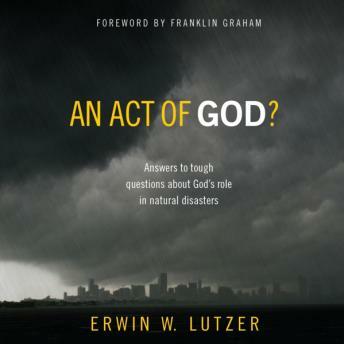 ), pastor and bestselling author Erwin W. Lutzer tackles this tough subject head-on, offering real answers as well as comfort and hope to those who struggle with challenges to their faith. In doing so, he addresses the questions we all ask, including: Does God care about what happens in this world? Do natural disasters mean God is angry with us? Can we still trust God? What, if anything, can we say to those who are suffering? If you've ever felt helpless and confused by the horrors of natural disasters, devastation, or loss, step inside this audio where you'll get to know the real face of God—and find the answers to some of life's most difficult questions.